Krazy first became animated during the second age of Krazy Kat, between 1916 and 1925—initially by Hearst-Vitagraph and Hearst’s International Film Service, then by John Randolph Bray, then by Margaret Winkler and Charles Mintz. Of all of these, the Hearst materials are the “truest” to the strip, in that they play with language in speech bubbles, and because Krazy is still crazy for Ignatz. However, the complex interplay between characters other than Krazy and Ignatz is gone, and even their relationship shows a slow decline toward niggling domestic strife and empty slapstick violence (e.g. see video 1). The Bray years maintain some of the romantic tension between cat and mouse, but intertitles replace the language bubbles and the drawing style, particularly of the background, loses Herriman’s signature minimalist technique of creating depth of field in panels largely composed of white space. 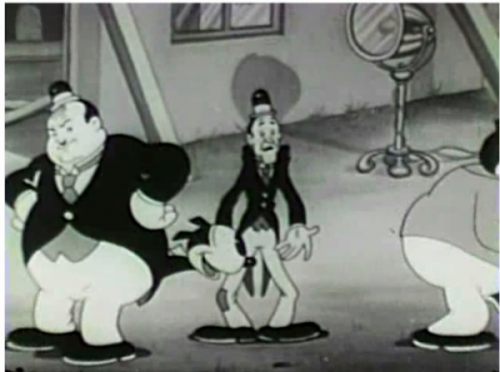 Instead, the backgrounds appear like vaudeville flats, a look common in cartoons of the early 1920s, and the action devolves similarly into barely loving bickering. 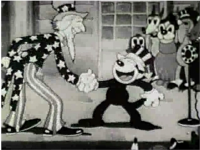 The third and final age began when the animator Bill Nolan took over the cartoon in 1925 and ran until Herriman’s death in 1944. Nolan produced the cartoon independently, but soon began supplying the husband and wife team of Margaret Winkler and Charles Mintz. The Winkler/Mintz period, first for Paramount, then for Columbia, was terrible: in the early Winkler years, Krazy appears more like Felix (with a magical tail) and Ignatz looks like the mice in Disney’s Alice Rattled By Rats (1925) and its Mickey Mouse remake, When The Cat’s Away (1929) (see fig. 8). Leonard Maltin quotes animator Harry Love, who claimed that the Krazy Kat cartoonists in this age would crib Disney cartoons at the cinema, “study [them], see what we could steal in ideas and everything” (Love in Maltin 1980). Manny Gould and Ben Harrison took over the franchise in the early sound era, after Mintz moved the cartoon to Columbia. Krazy became rounder and their gender, already tilting firmly to the male under Nolan, settled as masculine. There are a couple of exceptions, such as Prosperity Blues and Hollywood Goes Krazy (see figg. 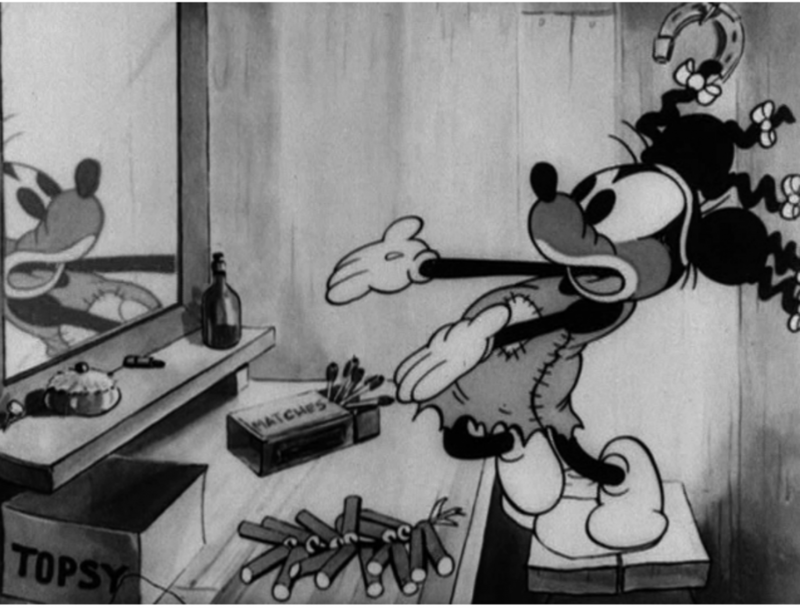 9 & 10), both from 1932, but even in those the gender ambiguity involves only what Maltin calls a “falsetto voice,” and Ignatz is replaced by a girlfriend, Minnie Mouse in cat form. Krazy is male, straight, and unambigious in every sense of the word. In these cartoons race continues to appear in its minstrel form, but as song and dance, not as wordplay. Their intro music is Gus Kahn’s 1922 Toot Toot Tootsie Goodbye, which Al Jolson had made famous in The Jazz Singer (1927). Beyond that obvious nod, though, Krazy is firmly in the minstrel mode of Felix and Mickey. Nowhere is this truer than in The Minstrel Show (1932), in which, as in Mickey’s Mellerdrammer (1933), the already implicitly minstrel characters double down by blacking up and performing a version of the minstrel’s olio. Here, in his masculinized, minstrelized form, Krazy performs an inversion of passing. The minstrel does not contravene the color line in order to deceive, derange, or destabilize, merely to entertain. Everyone is in on the joke, and it is the change in the inflection of that minstrelsy that is important. What has changed, ironically, is the evacuation—first in the silent era, and then with sound cartoons—of the complex and playful language of blackface minstrelsy. Krazy was a minstrel who was too quickly deprived of their voice. And not just her; everyone in Coconino County was rendered speechless, and in that erasure what was truly radical about the Krazy Kat strip was effaced, because every single character in Coconino County was a minstrel, blackface or no. That, to my mind, was the genius of George Herriman: he created, in cheap ink on flimsy newsprint, a weekly debate about the nature and the practice of human existence, performed by a collection of minstrels, passing as animals, and representing in good vaudevillian fashion a wide range of races, ethnicities and nationalities. This reading sees Krazy Kat as an implicit argument that the whole damn “American experiment” was (and is) a minstrel show, a massive phantasm on the order of the Grand Canyon (the heart of the actual Coconino County) in which we each encounter the nature of our existence, the practice of being in the world with others, as a performance, as an echo. It is messy. It is angry. It confuses violence for love and love for violence. It is most obvious as blackface—and that is part of the point—but is truly legible everywhere. When he links Herriman’s blackness to his comic strip, then, Michael Tisserand asks a too-small question, something on the order of: “Where can we see evidence of that blackness in his cartoons?” (Tisserand 2016). The drop of blood becomes the drop of ink. What gets lost in that question, what it so underestimates, is that the key term is not the binary, not whether Herriman was or was not black. No, what is more important is the liminality of his passing, the yes-and or neither-nor and their relationship to the ambivalence and indeterminacy that permeates Coconino County. The cartoon, embodied in Krazy, is a fantastic realm of relationality, of the instability of meaning and of identity. That more expansive question, yet no less indexical for it, becomes not only about Herriman’s relationship to passing, his fantasies of being both and neither, but also about our desire to read that relationship into submission…to re-impose the one-drop rule. Amirand, Eyal (2000). “George Herriman’s Black Sentence: The Legibility of Race in Krazy Kat”, Mosaic 33: 3, pp. 57-79. Heer, Jeet (2005). “The Kolors of Krazy Kat”, in George Herriman (ed. ), Krazy and Ignatz, Seattle: Fantagraphics Books. Maltin, Leonard (1980). Of Mice and Magic: A History of American Animated Cartoons, New York: McGraw Hill. Tisserand, Michael (2016). Krazy: George Herriman, a Life in Black and White, New York: Harper Collins. Fantastic narrative. Congratulations… we need more of this type of research and publications.